WASHINGTON (Reuters) - A senior Amazon.com Inc executive on Friday disputed claims raised by Representative Alexandria Ocasio-Cortez that Amazon workers face "dehumanizing conditions" as being untrue and invited her to take a tour of company facilities. Ocasio-Cortez, a newly elected progressive Democrat who was an outspoken critic of the plans to locate Amazon's second headquarters in a New York City neighborhood near her congressional district, asked on Twitter if Amazon's culture of "strict performance" is "why Amazon workers have to urinate in bottles & work while on food stamps to meet 'targets?' Performance shouldn’t come at the cost of dehumanizing conditions." Dave Clark, Amazon’s senior vice president of worldwide operations, responded on Twitter that the claims "simply aren’t true. We are proud of our jobs with excellent pay ($15 min), benefits from day 1, & lots of other benefits like our Career Choice pre-paid educational programs." He invited her to take a tour of Amazon's operations. 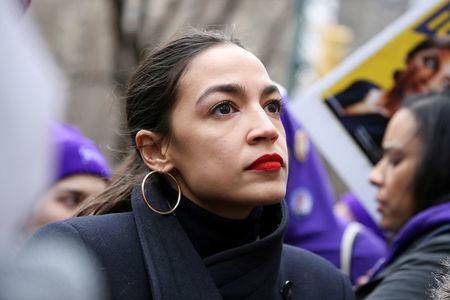 Ocasio-Cortez was among progressive New York Democrats who had objected to the $2.8 billion in incentives from the city and New York state to woo Amazon to build a new headquarters in the city's borough of Queens. Amazon abruptly canceled the plan on Thursday. "When the community wanted to negotiate, Amazon said 'all or nothing.' They bailed when they didn’t get 100% of what they wanted," Ocasio-Cortez tweeted. "Google came into NYC just fine. Amazon wanted to be Foxconn."